Quite often with recipes as I flick through Olive magazine or follow links on the internet, it’s a new technique that piques my interest. This was one of those. 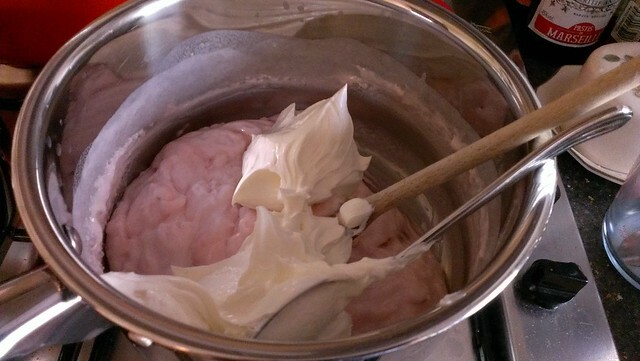 It starts with melting marshmallows in milk and using the gelatin from there as a setting agent. I used hobnobs for my cheesecake. The idea that a biscuit base doesn’t have to be digestive comes from Nigella’s Grasshopper Pie where she uses bourbon biscuits. I’ve just been to find that recipe again and was amazed to find that uses the same marshmallow technique! 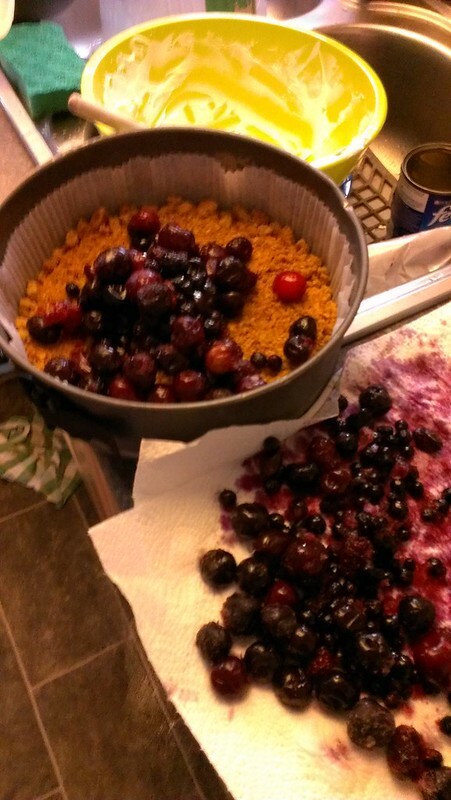 The cheesecake I made was not massively successful – it looked bad because the cream cheese wasn’t beaten enough, the frozen fruit mix was not nice, and the fruit juice soaked into the base and meant that the whole pie did not slice properly but fell apart. Next time I think I would either make a rough jam from the fruit or try blitzing the frozen fruit to a purée and then blitz it through the cheesecake mix to make a sort of smoothie cheesecake. Line a 23cm tin. Make a biscuit base from 200grams biscuit and 50grams butter. 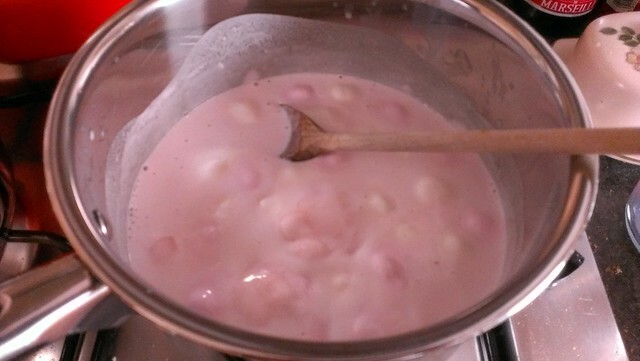 Melt 300grams of marshmallows in 200mls of milk stirring regularly over a very low heat. Once the marshmallows have fully melted, cool the mix. Mine separated a little at this point. Put most of a bag of defrosted frozen fruit on your biscuit base, reserving some fruit and juice to make a coulis to serve. My original recipe now calls for you to beat 500 grams of cream cheese with a teaspoon of vanilla essence, and whip 150mls of cream. Because that was two separate bowls, I decided not to let the Kenwood do the whipping, which was probably a mistake. Whilst I can whip 150 mls of cream by hand, it does make a bit of a mess of the kitchen. The texture of the final cheesecake shows clearly that the cheese wasn’t beaten enough to fully incorporate with the marshmallow mix. Some recipes get you to microwave the cream cheese a bit to check it properly integrates. Because of the sugar in the biscuit base and the marshmallows, there’s no need for any more in the fruit. 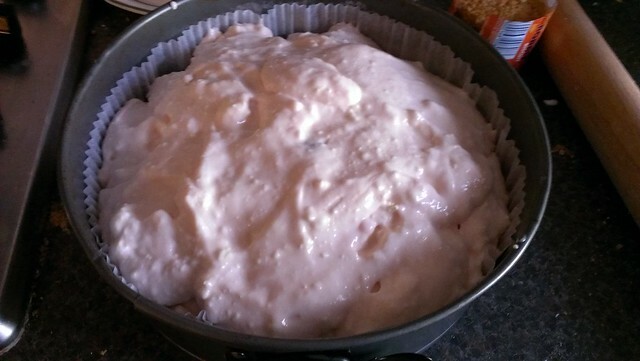 This entry was posted in Food and tagged cheesecake, disaster, marshmallow, pudding club.